A GEEK DADDY: Are your kids winning the "Sugar Wars"
Are your kids winning the "Sugar Wars"
February is National Children's Dental Health Month and dentists across the United States are making an extra effort to encourage kids to win the "Sugar Wars" through maintaining good care of their gums and teeth which is essential to preserving healthy smiles. 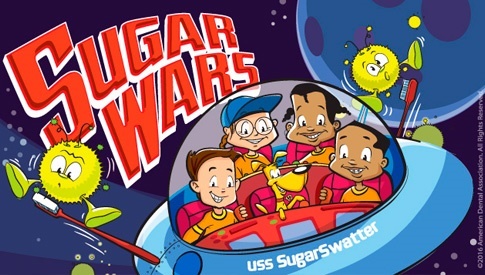 This month's "Sugar Wars" campaign is also an important reminder that developing positive dental health habits at an early age and scheduling regular dental visits help children get a good start on a lifetime of healthy teeth and gums. According to the Michigan Dental Association (MDA), more than 55% of third graders in Michigan have experienced tooth decay and over 27% have untreated dental disease. "Children's teeth are meant to last a lifetime, and a healthy smile is important to a child's self-esteem," notes Dr. Mark Johnston, MDA President. "With proper care, a balanced diet, and regular visits, their teeth can remain healthy and strong." To help parents have a conversation with their children about winning the "Sugar Wars", the good folks at the Michigan Dental Association have provided A Geek Daddy with a package of coloring and activity sheets which can be downloaded and printed out that promote kids swatting the sugars and taking care of their mouths. Good luck with the "Sugar Wars" - May the fluoride be with you ... always!!! CLICK HERE for tips, games and videos aimed to motivate and encourage children to do the 2MIN2X - brush 2 minutes, twice a day.